One of my favorite statistics about Washington, DC, is the number of lawyers working in the city: 50,000. That’s one lawyer for every 10 residents. Do these people directly benefit those residents? No, not really. Perhaps some of them do, or must, just by the laws of chance and probability. But certainly, many of those J.D.-carrying folks are members of an elite squad known as the lobbyists. They represent everyone from chemical producers to apple farmers to county-level employees. They’re not concerned about the people in the city so much they are getting into the city. And that is exactly where the residents made their stand. There is no highway that runs through DC, not a single one. Route 1 hurtles across the 14th Street Bridge and then dies like a snake slashed across its midsection, next to the Bureau of Printing and Engraving for the US Mint, and the Holocaust Museum. Traffic, if it was moving before the bridge, grinds into nothingness, silencing odometer needles as drivers wait for the traffic light to let them pass another 50 yards to the next intersection. At least there’s the Washington Monument to gaze at, if pondering what it all means is a suitable replacement for forward progress. I-395 takes up the rightmost lanes of that same bridge, and then shoots off to the side, skirting along the east side of the Federal Triangle until it dives underground, popping up above the surface again in its last gasp before it morphs into E Street and 1st, right outside a homeless shelter. Those wishing to continue to the Capitol Building remain underground a while longer. The artery of the entire East Coast, I-95, dodges around the city, merging for several miles into the dreaded Beltway until the District has been passed and defeated, and then it makes its way to Baltimore and points north. And I-66, “America’s Highway,” peters out in a graceful plot of green grass along the Tidal Basin, as if it was just a mythical piece of infrastructure the city doesn’t need. 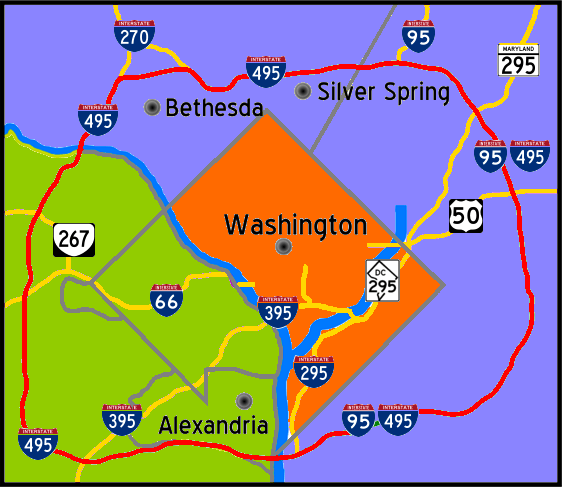 In the 1960s highway plans were drawn up that would have criss-crossed DC under a network of ramps, raised concrete, and asphalt. The residents knew this would entail a great many moments of imminent domain justification as their neighborhoods were chopped up and dismantled for the likes of commuters who would never deign to live within the four stone markers of their city. They formed tenant and homeowner groups, and pushed back, hard. Perhaps they were looking at other cities where similar developments had destroyed communities—Detroit, St. Louis, Syracuse, and Baltimore all provided examples of how poorly things had turned out for the poorest sections of town, which always seemed to be where the new infrastructure was proposed. Nobody had sketched up a highway through hoity-toity Cleveland Park, after all. The residents won, and the Beltway project was born, giving Americans an omnipresent metaphor for insider/outsider politics and the mythos of the US political system. Los Angeles is way too large to have entertained the dream of highway-free city travel, and its addiction to driving, even for the span of a few blocks, has pushed out effective subway architecture, light rail, and busing. Sure, there are buses. But they’re not a commuter’s preference, not at all. Cupping the valley, the cars meander this way and that, and engines idle in miles-long stretches for the chance to continue a sluggish crawl on one of the many, many freeways drawn over the landscape. Where DC drivers hug the bumper in front of them so as to ward off the other aggressive vehicles, LA drivers wave people in. There is nothing so fine as to see a long queue of cars all neatly merging together like a zipper on a pair of bluejeans. Except reaching one’s destination, that is. For the last decade or so, DC and LA have been in an unintentional battle over worst traffic in the country. LA has taken the top spot in the last few years, but DC is a close second, and given the animosity of its drivers, I think it should reign supreme. Because even if there are more roads, snarls, and longer commute times in LA, the people are just too nice to make it as awful an experience as it is in DC. ETA: In the 2010 Forbes poll, DC only managed the fourth slot. LA was number 2, and New York City the most godawful place to drive in the US. Maybe the Angelos are nicer because they get more sunshine. Certainly they don’t have to deal with snow, or the threat thereof.